Welcome to my blog. I hike and camp in the mountains of British Columbia, Canada, and I am a professional musician. Feel free to say hi and have a look around. There's lots of posts about my hikes and various movies from these adventures. 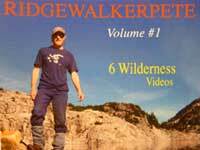 Filmed in British Columbia, Canada with original music by Ridgewalker Pete Tennant More about the DVD here. $14.99 US/CAD includes shipping and handling. This is a Flickr badge showing public photos from The Ridge Walker. Make your own badge here.